Four bedroom, three and a half bath, 4,049 sq. ft. elegant home on 4.98 acres in the prestigious gated community of “The Ranch at Sky Mesa”. Located in Southwest Riverside County at 2400 ft. elevation. 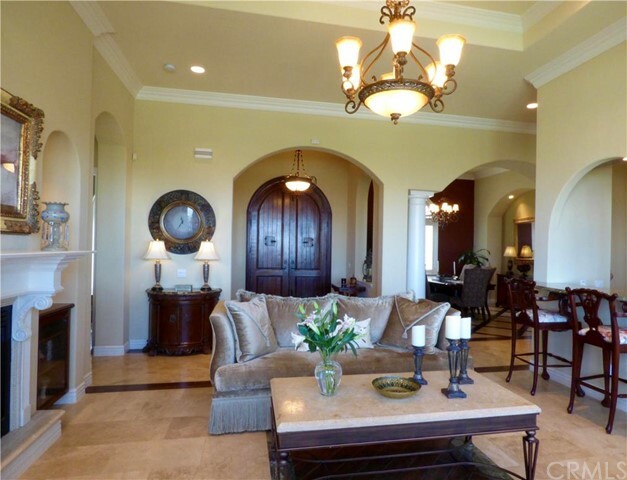 Situated in the hills above Nuevo and Menifee Valleys, offers magnificent views. Home is superbly positioned to take full advantage of these spectacular panoramic views of the entire mountain range and valleys below. This custom contemporary single story home has been quality built w/comfort & convenience in mind. Enter into the foyer to be amazed w/ the dramatic trey ceilings, extensive crown moldings, beautiful flooring & an incredible welcome into a wonderful living room & butlers bar leading into the cooks kitchen/family & dining room. Natural light, custom lighting & sound systems throughout. Magnificently appointed gourmet kitchen features top of the line stainless steel appliances, impressive amount of cabinets & spacious island for entertaining w/ open family room & inviting fireplace. Masterfully coordinated en suite is undeniably impressive. Exquisite unexpected custom dream! Perfect family or second/retreat home! RV Hookups and plenty of room for toys. Private & secure community! Centrally located w/ a short commute to the I215, Hwy 74 & 79! Please contact us to help you to sell your home and find the home of your dreams! We specialize in Laguna Beach, Newport Beach, Dana Point, San Clemente and our inland coastal communities. This entry was posted in RE/MAX Evolution News. Bookmark the permalink.